Disney Imagineering has an annual competition open to creative students in which they submit project ideas. Finalists present their ideas in Glendale and may possibly secure an internship. The year I participated about 300 projects were submitted and I was one of the top 30 selected as semi-finalists. My concept was to use land that was once the Disney Institute. 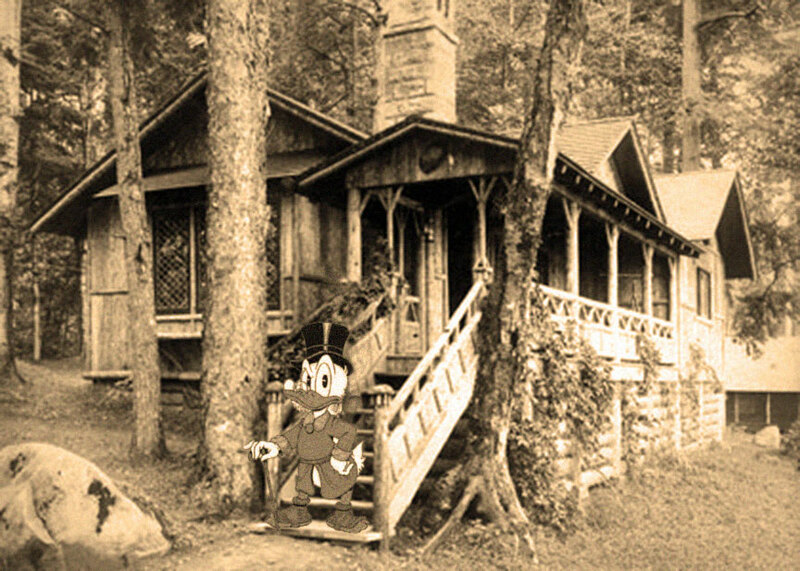 This property on Bay Lake had tree cabins, was developed then largely left abandoned. Being an Eagle Scout I enjoyed summer camp but always wished there were better, more creative options to pursue. I’d been fascinated too by the McDuck family world done in the comics by Carl Barks. I put these interests together and Camp Buena Vista was born. To get my idea across and incorporate the branding, look and mood I was going for, a custom box was designed and built by me in which to submit the project. A slot for the film was incorporated; the outlines seen above and below were printed on high quality card stock and fitted with custom folders; miscellaneous vintage scouting artifacts were included to add to the texture. The film made to accompany the box was art directed to appear that it was produced at the time of the Paul Bunyan short in 1958. The film was built using real paper textures and then animating them in AfterEffects. I begin with map and then slowly built up what the possible daily routine would be for each specialty. Dan Dare: Flat of The Future was a project that mixed all of my favourite things... post war British decline, camp comic books, and 50’s and 60’s futurist designs. The floor space was restricted immensely, and required a lot of intense planning, along with incorporating some of my favourite looks from the early 60’s..
Dan Dare is a comic little known in the States, but has a huge following in the UK and the Commonwealth. It could basically be distilled as the World War 2 RAF in space. Dan Dare’s flat was destroyed by a landing gone awry, and for his service the high command gives him the most forward looking flat, with inspiration from Syd Mead at US Steel, Chelsey Bonestall’s rocket illustrations, and a dollop of Kubrick. Production design is the most fun but also the hardest design I have done. This set was for House of Blue Leaves, and required a 60’s NYC flat with multiple doors a window with a fire escape, a piano, and kitchen. The site lines space efficiency had to be perfect before one could worry about period details.